With changes to Wisconsin auto insurance laws that will slash the amount of coverage motorists must carry set to take effect in little more than a week, opinion remains as divided as ever about the implications for consumers. Legislation that applies to all policies purchased or renewed as of Nov. 1 reverses some of the amendments to state law enacted in 2010 that required all motorists to purchase coverage and roughly doubled minimum levels mandated for those who buy policies. Those changes, ushered in by a Democrat-controlled legislature to keep pace with rising medical costs, were targeted when Republican lawmakers took control of state government in January. Insurers and other supporters said minimums had to be reduced to lower coverage providers’ costs and stop premiums from skyrocketing. 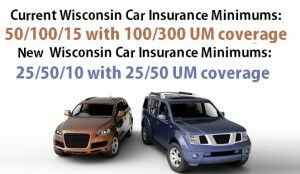 Starting next month, Badger State drivers will have to carry enough liability car insurance to cover damages of up to $25,000 for bodily injury to one person and up to $50,000 per accident. Policies must also cover a minimum of up to $10,000 worth of property damage caused by policyholders. Those levels—commonly referred to as 25/50/10 by insurers—replace the minimum 50/100/15 coverage requirements implemented last year, which were among the highest in the nation. The law also eliminates the requirement to carry underinsured motorist coverage and reduces the minimum amount of protection against uninsured motorists from 100/300 to 25/50. Insurer associations and other organizations that have supported the impending changes say the 2010 increases drove up costs for insurers–in turn increasing premiums statewide–restricted consumer choice and forced some Wisconsinites to forgo coverage altogether. The lower coverage levels will make it easier for many motorists to afford policies, according to Jeffrey Junkas, a regional manager for state government relations with the Property Casualty Insurers Association of America (PCI), which lobbied for the reductions. Critics of the lowered requirements, meanwhile, say they fail to account for massive increases in health care costs in recent years. Ed Vopal, president-elect of the Wisconsin Association for Justice—formerly known as the Wisconsin Academy of Trial Lawyers—said the reduced requirements benefit insurers at the expense of policyholders by limiting claim payouts to amounts that will not be large enough to cover the costs of accidents. “It damages and directly hurts Wisconsin consumers,” Vopal said by phone. What impact the increases—and subsequent reductions—in minimum coverage levels will have on premiums in Wisconsin remains unclear. Increases in average premiums caused by the higher levels were projected to be anywhere from 1 percent to more than 30 percent. Junkas said the reduced coverage requirements will offer consumers the option of buying minimum amounts or higher levels. “You can always buy more insurance,” he said.